I’m a born Phoenician, and I find it unfortunate that among my friends (who are also from Arizona) and among my classmates (who are often from out-of-state), the general consensus is that the Phoenix cultural and arts scene is “not really there.” It’s “stagnant,” and “spread out all over” the metropolitan area. But the truth is that Phoenix does have great artists, and several of them have graced our cyber pages in the last five years; one in particular that still stands out is Christopher Jagmin, whom we originally featured in Issue 4, and whose work was the inspiration for our new logo and banner. Trish and I decided that it would be a great experience to visit Jagmin’s workspace. 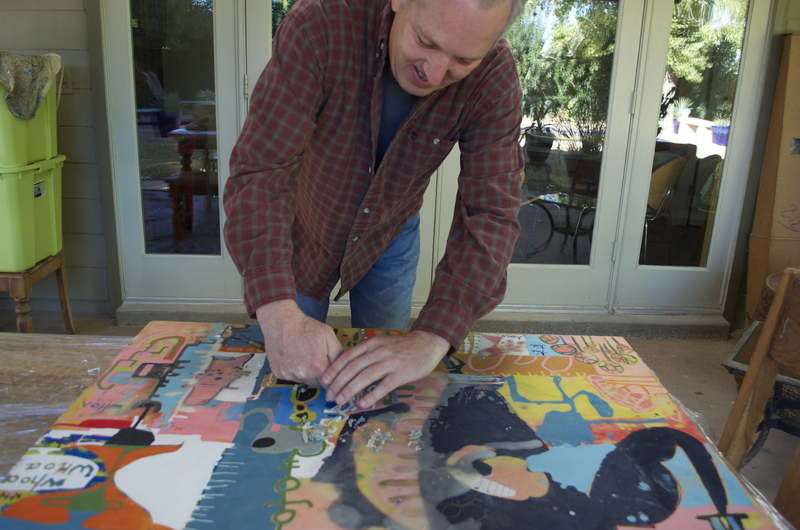 Jagmin works in encaustic painting and the magic happens in the backyard of a house painted light green in downtown Phoenix—just blocks away from the neighborhood where I grew up, in fact. It was too windy and cold for a demonstration but Jagmin walked us through the process of creating one of his encaustic paintings on wood, and even gave us some history on the art of wax encaustic painting. In ancient times sailors covered the outer surface of their ships with beeswax, and over the years the practice came to include painting and decorating the exterior of the ship. Encaustic paintings were discovered in the 1st century as mummy portraits and the tradition was later brought back by artists like Jasper Johns in the 1960s. The method of painting also had a resurgence in the ’80s with mood painting, and it has more recently made its appearance again. However, Jagmin’s work with encaustic isn’t traditional, because while many encaustic painters use the wax to give their paintings a more polished look, Jagmin uses encaustic for the process and what the process allows him to do with color and space. 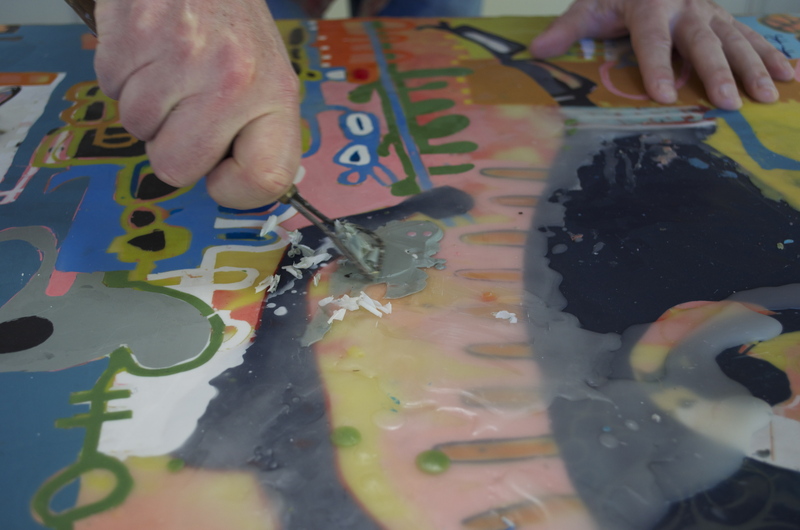 His work doesn’t always boast the smooth finish that many encaustic painters go for. He still has a high level of control over the composition, but he layers on the wax and the paint, and then he carves away, adding more layers, and carving again. He has an array of carving tools, a heat gun, a hot plate, an iron. Sometimes he will draw a quick sketch of an idea or two, but “the point,” he said, “is to tell a story…to capture an idea, a desire.” He uses symbols and images with the idea of hieroglyphics in mind. A good-sized piece, he gathers, takes anywhere from 80 to 100 hours, though it was hard to say exactly how long it takes him to complete a painting, since he works on several at a time. Whenever he returns to a piece, he has to carve and dig and remember what story he was trying to tell. Jagmin also expressed concern for the art community in Phoenix. There are great artists, great venues, and great things happening in the Phoenix art community, but because it is spread out through the valley, it is difficult to draw people to the exhibitions and to have people think seriously about the art that is being created. But the efforts are being made and Jagmin hopes that soon the community at large will become more involved with the arts. March 2: 10 a.m.-3 p.m. Learn the basics of working with encaustic in a hands-on exploration of this ancient wax art form. Encaustic is composed of beeswax, tree resin and pigment, applied hot, and fused to produce works that are translucent, sculptural and rich. 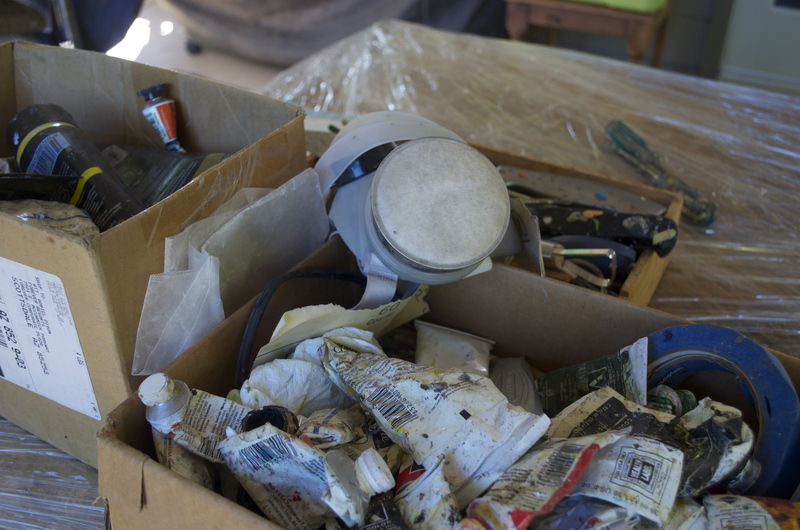 After learning a brief history of encaustic, students will learn to make encaustic medium, paint mixing, basic fusing techniques, and layering. The goal of each of these half-day workshops is to become comfortable with encaustic, and finish 1-2 pieces of artwork. If you have always wanted to try encaustic, this introduction is a great way to get started! No experience necessary. This class is limited, so reservations are necessary. Jagmin was gracious enough to answer some of my questions through email. 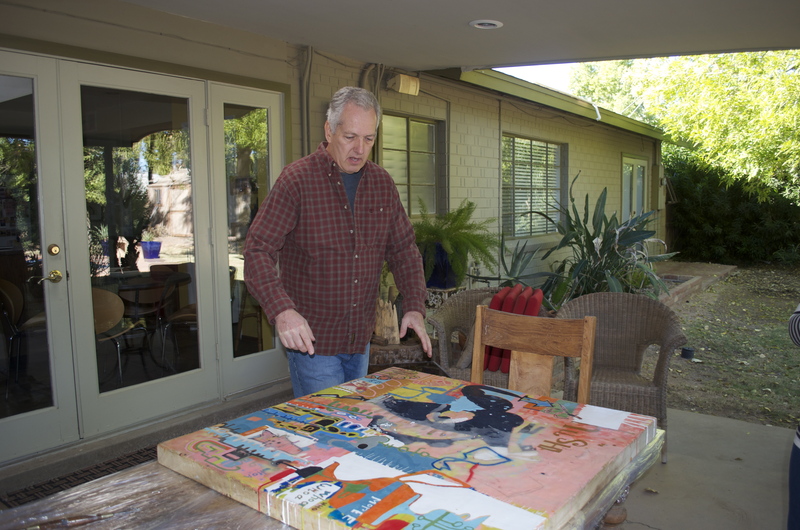 How did you come across and begin to use the medium you now work with (encaustic on wood)? Have you worked with other mediums? When I was living in Boston, I worked as an illustrator and as a graphic designer. Time was very precious as I worked about 65+ hours a week, and on a track to burn myself out. But, I was young and wanted some money in my pocket, and frankly, liked the work. I always liked pencil drawings, and also painted with gauche and oil paints. But, I rarely had the confidence to show my work in a public form. Once in awhile I showed my pieces, but I had to be dragged, screaming and kicking. Recently, I started working with pencil drawing again, and this time, it is much more like fun. In Boston, every painter that I liked seemed to be an encaustic painter. I really loved the medium, but it seemed so mysterious and difficult. I did not try the process until I took an encaustic class in Phoenix about six years ago. Then I knew this was the medium for me. Working with encaustics allows me to add and scrape away layers of wax and oil as I paint. These layers then merge together, or form new images. My work does not follow the encaustic historic tradition, and I think of it as almost a sculptural way to paint. Those are the reasons that I love encaustic painting. It really gets me into the paint and helps me to build stories. What and who are some of your influences? I am also greatly influenced by comic books, Chinese scrolls, graffiti, outsider artists, Indian miniatures, and graphic artists. Basically, I can find inspiration all around. What goes into giving a piece its title? Is the title important? I title my pieces after the painting is complete, and I separate myself from the work for a little while. When I am ready to see the work again, I look and try to remember what the experience of painting was, and also think about the story I was trying to tell at the time. The experience for me is oftentimes quite different viewing the work again. I want to give the viewer a title as a jumping off point to interpret their own story. The color series that I worked on earlier this year was very different, however. I just numbered them in order of the work. I wanted to see if the stories could work alone without titles, words, or symbols. When I was a kid, I wanted to become an animator, and dreamt of working for Disney. I would draw stories in comic form for hours. I would make flip books, and also write comic strips for my family and myself. I always liked storytelling, and since I am not a very good writer, it made sense to tell stories with my art. So, words in my artwork made sense to enhance and move my storytelling along. Your earlier work is more abstract and your work has progressively acquired more narrative (more words), has become more defined, and, I would even say, more concise. Are you aware of anything that has influenced this change? For me, using words has a direct link to comic book storytelling, and I think that I started being more confident in understanding that connection, and am proud of my comic story telling. I absolutely get a kick out of words in comic strips that suggest sounds (onomatopoeia). You know…words like plink to suggest bad piano playing, or rain drops. I also like coined and slang words, both past and present. For some reason, humans like to develop new words. It is especially a youthful expression to throw off an older generation. I love to mash up some words or expressions and play with them. A lot of the words in my work suggest a story, and oftentimes are puns and plays on words. Hopefully they are not obvious or suggest too much. What do you think is art’s relationship with words? That is a difficult question to answer, but there will always be artists who like to straddle the edge between writing words and art. Words can provoke, make you think, inspire, and offer public discourse. There are divergent artists like Ed Ruscha, Nam June Paik, and the art movement Fluxus, Japanese calligraphers, and René Magritte who enjoy commenting on society, question authority, or just like to make beautiful works of art. Do you plan a composition or do they occur in a more spontaneous manner? I start out with good intentions and do sketch some ideas that become the starting point for a painting. It is rare, however, when I stick to my sketch. As I work and start playing with the layers in wax, I may see something that interests me and compels me to keep that piece in the work. But generally the theme and the “big idea” stays put. I actually work on a few pieces at once, so it is hard to know exactly how long each work takes. I get asked that question quite often, so I did try to track a couple of works, but it gave me the idea of filling out a time sheet for work, so I quickly abandoned that idea. But, I would have to say that on average, I might complete a medium sized work in a month’s time.